Easy, creamy and comforting Instant Pot Thai chicken soup that is full of hidden veggies. Stove and slow cooker instructions included. In Instant Pot, add chicken, sweet potatoes, onion, coconut milk, tomato paste, water, fish sauce, maple syrup, red chili paste, salt and kaffir lime leaves. Do not stir. Close the lid, turn pressure vent to Sealing and press Pressure Cooking on High for 20 minutes. After Instant Pot has finished cooking, release pressure using Quick Release method by turning valve to Venting and open the lid. Remove chicken onto a plate and shred with 2 forks. Using an immersion blender, puree the soup inside the pot. Return chicken back to the pot along with peanuts, lime juice and cilantro. Stir and serve warm. 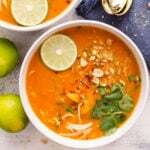 Make Ahead: In an Instant Pot insert or a large bowl, add all ingredients except water, peanuts, limes and cilantro. Cover and refrigerate for up to 2 days. Transfer all the contents into a pressure cooker when ready and cook as per recipe’s instructions. To make this soup in a slow cooker, cook on Low for 6-8 hours or on High for 3-4 hours. To cook on the stove, saute onion first. Then simmer everything for about 30-40 minutes.